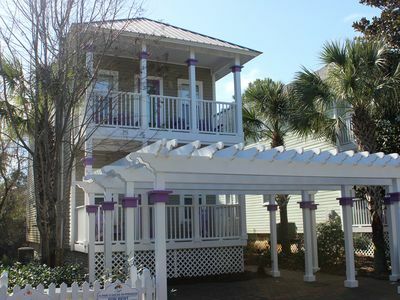 3BR "Serenity Now” w/ Pool & Outdoor Shower, Winter Dates are Filling Fast! This modern house sleeps 12 and is brimming with extras. 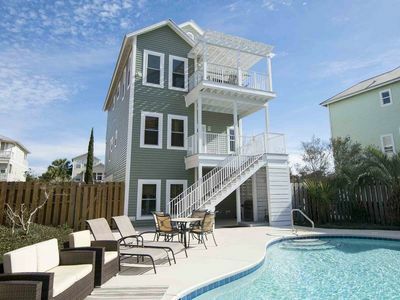 3 bedrooms, 2 full baths and 2 half-baths and more sleep space in a loft, it boasts a 2175 sq ft. interior. 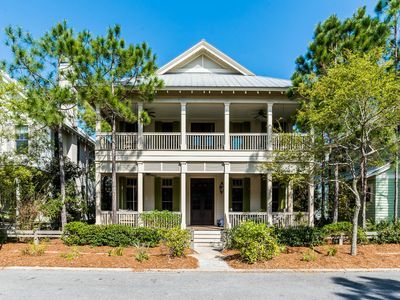 Walk just steps to white sandy beaches, dining on 30A, and more. 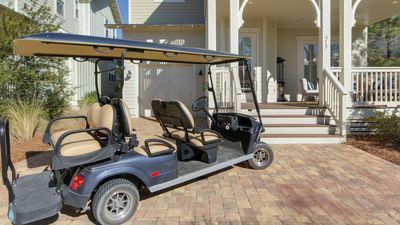 There is parking for 4 in the driveway, and you’ll access the contemporary three-floor home from the side porch. 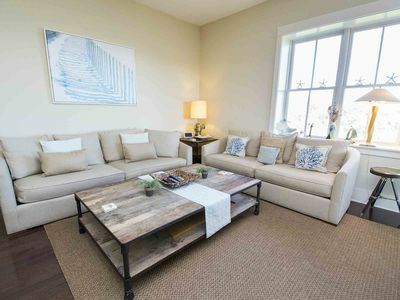 Lofty ceilings, quality fixtures, inspiring wall art, hardwood flooring, and roomy bedrooms all impress. The first floor boasts a full size bathroom with updated fixtures, a new single vanity with granite counter top, and shower/tub combo. 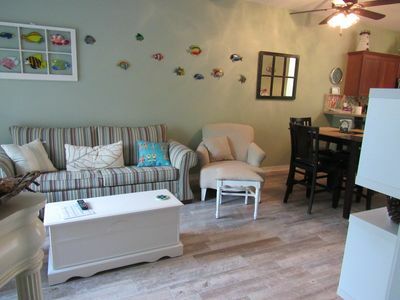 On your left is a great room for kids which has a full over full bunk bed and an extra large 49" wall mounted TV to watch their favorites shows on. Down the short hall is the 3rd bedroom with a king size platform bed with storage underneath and a wall mounted 49" TV. Easy access to the patio outside make this an ideal room. 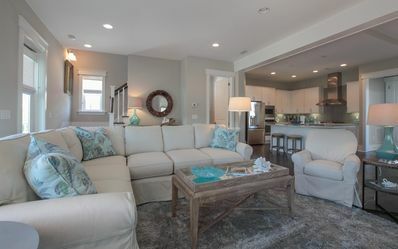 The open plan design of this floor makes it easy to gather together. In the living space, you’ll find an L-shaped couch. A 55” wall-mounted TV is ideal for nights in, or perhaps you’ll take in fresh air from the 2nd floor balcony, you’ll find patio seating for 4. A table in the dining area has seating for 8, and there are 4 barstools nearby at the breakfast bar’s granite countertop, ensuring seating for 12 for meals. 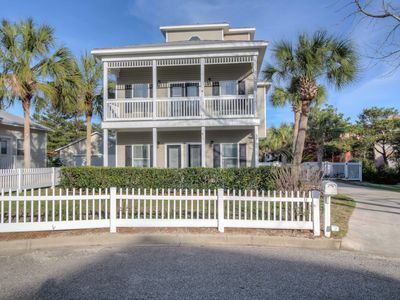 In this fully equipped kitchen with elegant white cabinetry, there is an array of stainless steel appliances, including Whirlpool electric stove and oven, dishwasher, and refrigerator. 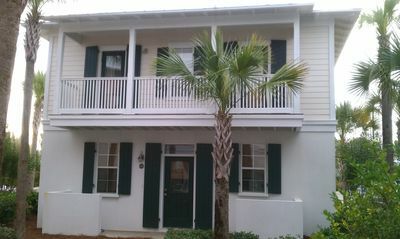 To the left of the stairs is the master bedroom which has a king bed and access the 2nd floor balcony. There is also a day bed- perfect for families with young kids who want to sleep near parents. 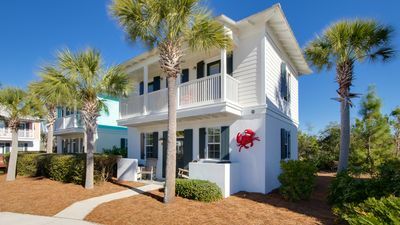 There is a mounted 50” TV with cable, and an en suite bathroom boasting dual vanities, a stand-up shower, and a jet tub for relaxing after sun-soaked days at the beach. The 3rd floor loft has a half bath and several sleeping options, including a futon and twin bed with trundle. 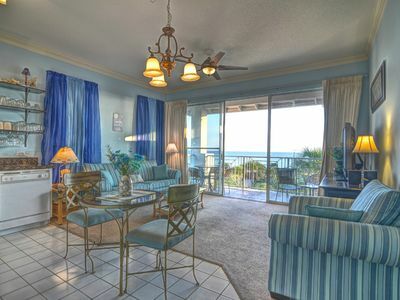 Enjoy a TV and elevated views, with access to the 3rd level balcony. The outdoor area features a private pool. Cook on the gas BBQ grill, or hang by the pool, with at least 4 lounge chairs and seating for 12. The dining table has 6 chairs, and an outdoor shower should prove perfect for sandy toes. Throw those wet towels in the garage where the washer and dryer are located. Guests have full access to the garage. Pool can be heated in winter months at the rate of $50 per day for three or less days or $40 per day for week long stays. 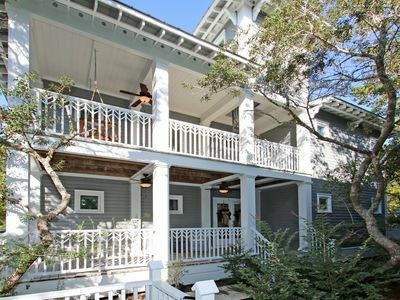 This home is located on beautiful 30A, across the street from the white sand beach, less than 400 feet. You can walk over in the morning for a seaside walk, and then come back later in the day for swimming. 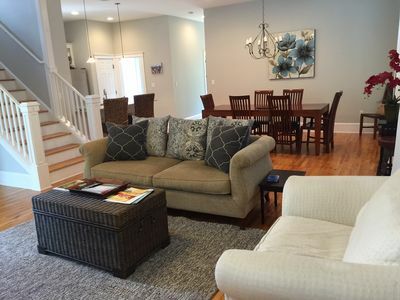 This home is also walking distance to many restaurants and stores. 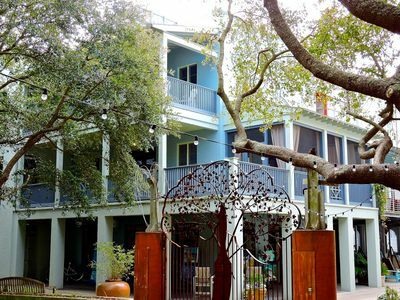 Stroll to boutiques and cafes on renowned 30A (around 300 feet away and on the beach side of 30A(No major streets to cross). Try Marie’s Bistro for a seafood and sushi lunch, then indulge in an upscale experience at Trebeaché for dinner. Also only 1 block from Blue Mountain Creamery and Big Daddy's bike shop. Big Redfish Lake, a 15 minute walk, is a beautiful setting for hiking, fishing, and birding, or you can hop in the car and explore the serene coast, with Destin only 30 minutes away. 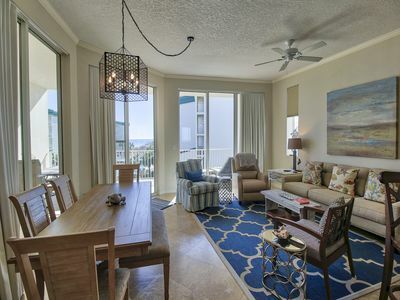 Gulf-Front Condo on 30A w/ Spectacular Views! Book Today! 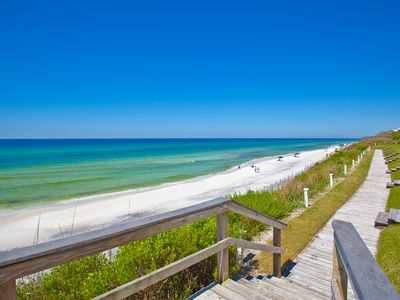 Beach side of 30A. Perfect Family Retreat!!! Efficiency Unit Behind Town Square in Seaside. Spring and Summer 2018 - book now! 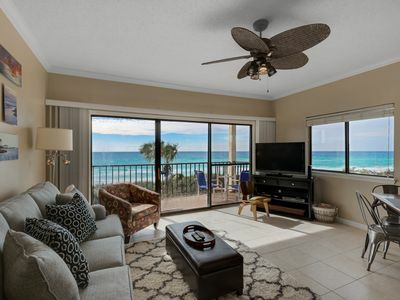 Lovely 30A Condo w/ Gulf Views! Includes BEACH SERVICE! SPRING RATES ARE HERE! Book now for Spring 2019! Amazing property with one-of-a-kind views! 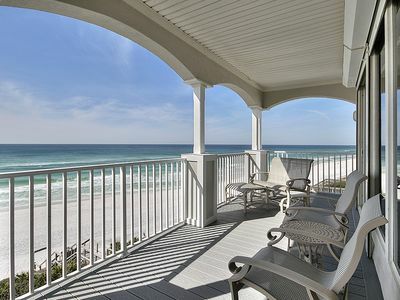 Dunes of Seagrove C201 - Ready, set, book for spring!